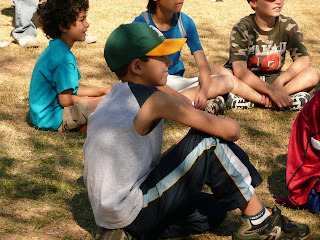 From the Trenches: My kid, the football player! 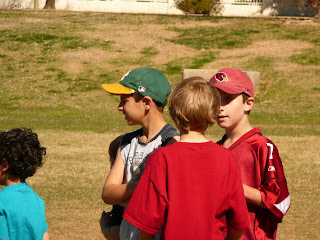 My kid, the football player! Parker will tell you that "his game" is baseball. Basketball comes in second, and football falls somewhere around third, if not further down below tennis and swimming. 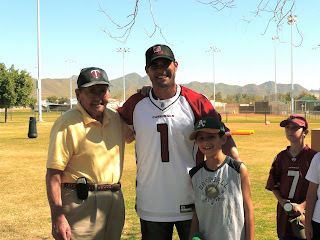 But for today, Parker was not only a fan, but a player! 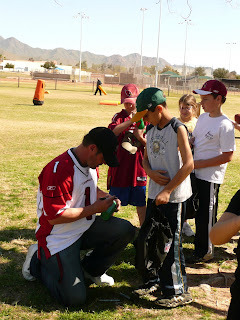 The Arizona Cardinals hold these kid-camps throughout the valley. Usually they are packed, but this one, being over spring break and all, was small so the kids got a lot of 1:1 attention from the coaches and the player, Neil Rackers. It was a fantastic way to spend a lovely spring morning!! Still in a pollen-induced fog.